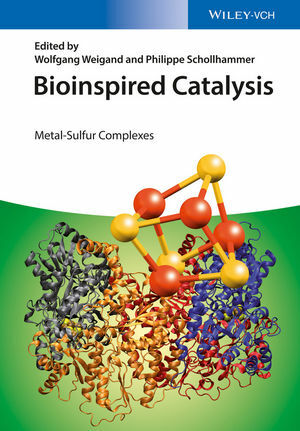 This book provides an overview of bioinspired metal-sulfur catalysis by covering structures, activities and model complexes of enzymes exhibiting metal sulphur moieties in their active center. Wolfgang Weigand received his PhD degree from the Ludwig-Maximilian-University of Munich under the supervision of Professor W. Beck in 1986. After a postdoctoral stay with Professor D. Seebach at ETH Zurich, he finished his habilitation at Ludwig-Maximilian-University in 1994. Since 1997 he is Professor of Inorganic Chemistry at the Friedrich-Schiller-University Jena. He has received the "Forschungspreis der Thüringer Ministerin für Wissenschaft, Forschung und Kunst" and he is also "Ordentliches Mitglied der Akademie gemeinnütziger Wissenschaften zu Erfurt". Philippe Schollhammer, Professor of Chemistry, obtained his PhD in 1994 at UBO (Université de Bretagne Occidentale, Brest-France) under the supervision of Professor F.Y. Pétillon. In 2001, he joined during a sabbatical leave the group of Professor R.H. Henderson at the University of Newcastle upon Tyne, UK. His current research interests include activation of small molecules by organometallic dinuclear complexes.